I really need to have a day of sharpening before I start my next project, but I got my hands on some beautiful curly maple and couldn’t wait to start working on the flag box for my mom’s memorial flag. So I pulled out my kerfing plane and started resawing. Here’s a sneak peak. This entry was posted in curly maple, Flag Box and tagged curly maple, Flag Box, resaw. Bookmark the permalink. Looks like you will be using your frame saw again soon. Question: Are you happy with the 3 foot length, or do you think an extra foot of travel would be better? I have never come to terms with my bandsaw and plan on building a frame saw for re-sawing. But I don’t know which length to go with. I ain’t a big person (5″6″ & 135 lbs) so bigger is not always better for me. The 3 footer works perfect for me. I think the decision should also take into account how much space you have. Shannon said something about needing 4 to 5 feet off the end of the bench to be able to use the 48″. PS. I spend a lot of time setting up my bandsaw .. and then it doesn’t really routinely give me the cut I want. I thing my band saw is going to be mostly used for cutting curves. Try befriending a retired shop teacher and have him take a look at your bandsaw. That’s what I did. He helped me get mine in beautiful working condition, even though it isn’t from the best era of Rockwell bandsaws. 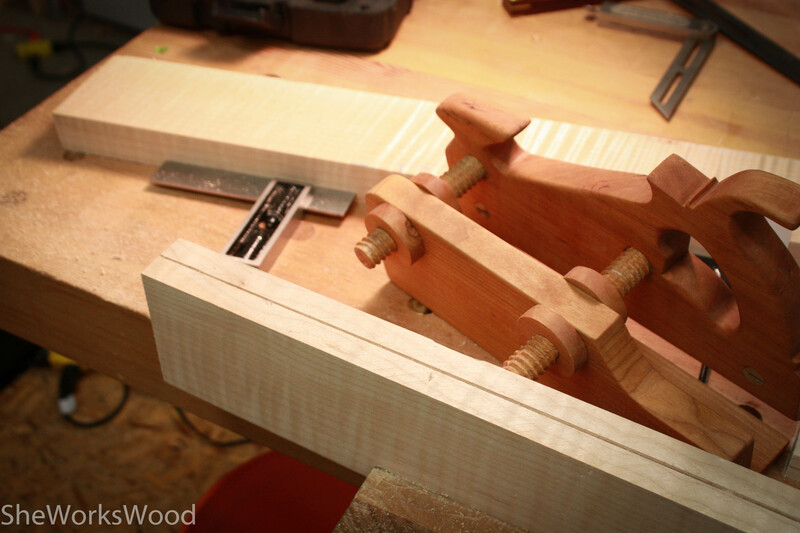 Last weekend, I was using it to cut out a couple mandolin necks out of some 8/4 maple for my best friend. The straight cuts were so precise and smooth, I tested one and was able to clean it up with three swipes of a block plane. It was poetry. Now, it sits on one of the bases with four legs, so I have some vibration issues. I’m going to try stacking a few sandbags on the lower shelf to see if that helps reduce it. But, even as-is, I rather enjoy it. Nice to enjoy one of the few power tools in your shop. Yes, that’s a great idea .. now I just need to find one. 🙂 I did end up using it to resaw my interior popular and it worked fine. It’s inconsistent and seems to require a lot of fiddling to get it to work correctly every time I use it. I haven’t completely given up on it, but I don’t trust my really nice wood to it.